Thankfully, If it hadn’t been for the national media, I would have been able to pass over the beginning of this week (Oct. 29/30 2012) as a patch of blustery, damp weather. There was little in our immediate experience that hinted at the true proportions of the storm. Why, meteorologically, were the hurricane’s effects up here so happily modest? And, historically, before the advent of satellite weather monitoring, what did people know about approaching bad weather? Both of these questions can be addressed historically. The first by comparing what we felt this time around to past hurricane impacts relative to the tracks taken by the varying storms; and the second by looking at some of the decades-old storms and at early weather prognostication in a bit more detail. Being neither historian nor meteorologist, this will be a shallow treatment. For example, hurricanes interact with continental weather systems in a variety of very important ways – in this summary, I ignore those interactions. Our area has been hit by several hurricanes during the past century or two. According to NOAA’s Historical Hurricane Tracks page, the eyes of fifteen hurricane-force storms have passed within 200 miles of us since 1842. 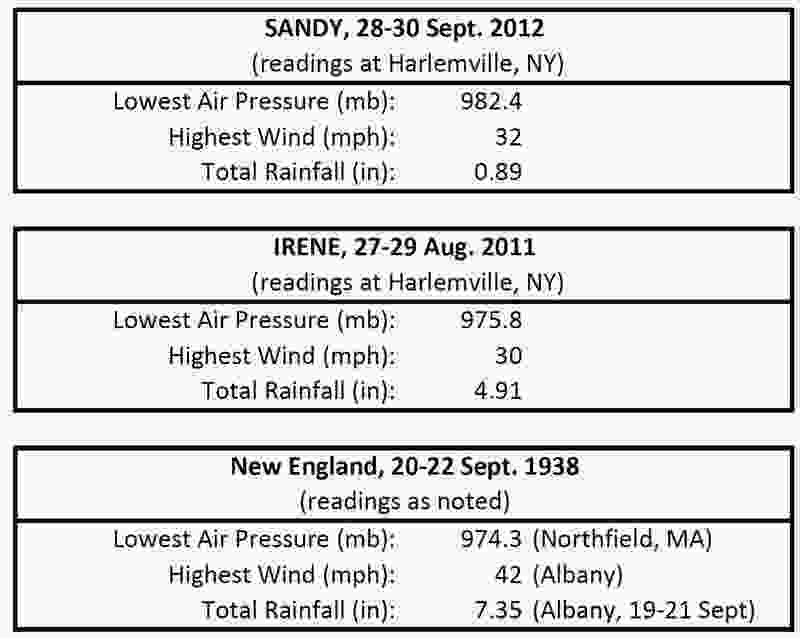 In this blog, I’ll discuss three storms – the Great New England Hurricane of 1938, Irene in 2011, and Sandy of this year. 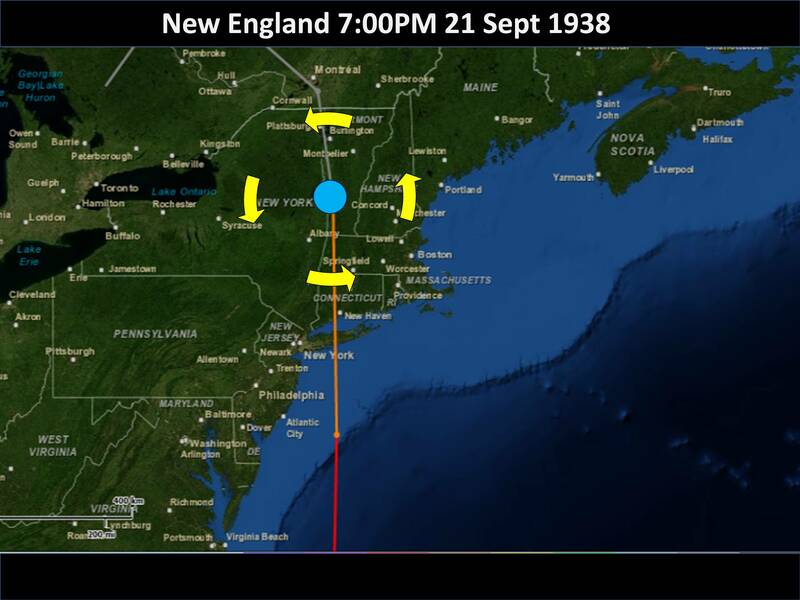 The Great New England Hurricane stormed ashore unexpectedly on 21 Sept. 1938. It crossed Long Island and headed up the Connecticut River Valley. Around 700 people died and many homes were destroyed. Great swathes of forest were knocked down. (For more detail see, for example, this video, this web page, and this report.). This was a category 3 hurricane (sustained winds of 111-130mph) when it made landfall in New England. 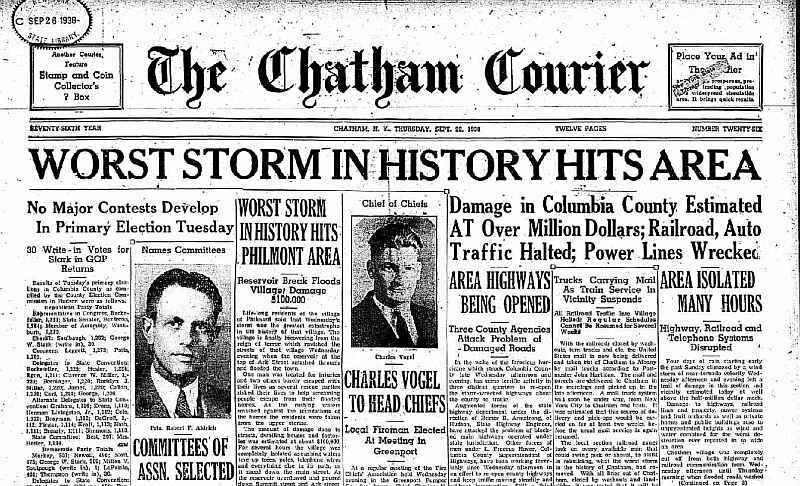 The headline above describes its impacts on Columbia County; These included a breached dam which caused extensive flooding in Philmont. Hurricane Irene hit our area in 28 Aug. 2011. 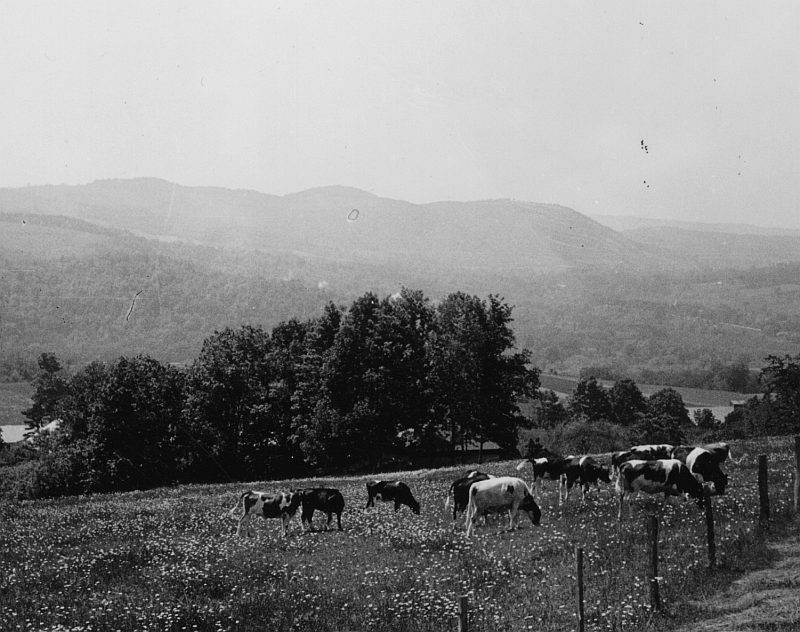 It skirted the East Coast and then, more or less, followed the eastern board of New York State northward, finally slipping eastward and crossing through Vermont and New Hampshire. Irene was a Tropical Storm (sustained winds of 39-73 mph) when it reached the Northeast, having been a category 1 hurricane for its trip up the Coast. This storm caused at least 25 deaths in the Northeast and extensive flood damage. Hurricane Sandy came ashore as a category 1 hurricane (74-95 mph winds) a bit more than 200 miles south of us on 20 Oct. Damage and deaths from Sandy are still being calculated. This table summarizes some of the features of our three hurricanes. As we try to understand the different impacts of these storms on us, let’s look at these storms in reverse order. 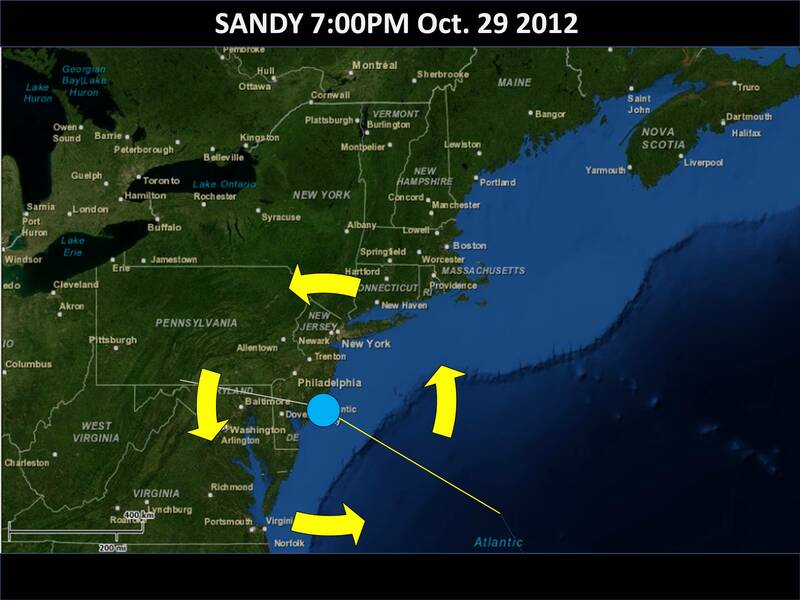 Above is a series of maps indicating Sandy’s path as gleaned from NOAA images. I’ve overlain arrows indicating the general direction of flow around such a weather system. In this and all remaining maps the size of the arrows says nothing about windspeed; instead, I just stretched the arrows as needed so that predicted wind direction in our area was evident. 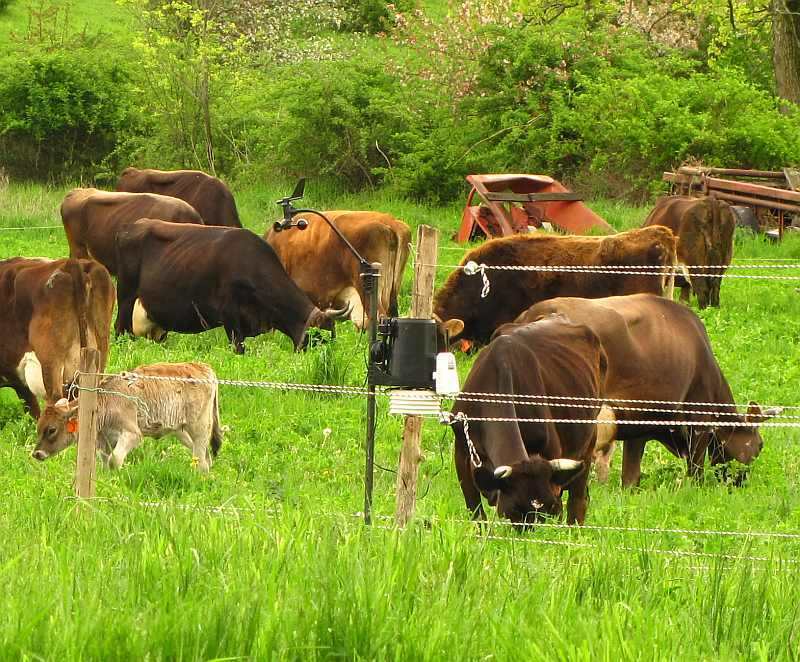 To take a look at local consequences, we can tap the data of our local weather station which is out in the pasture. To see this figure in more detail, please click on it. 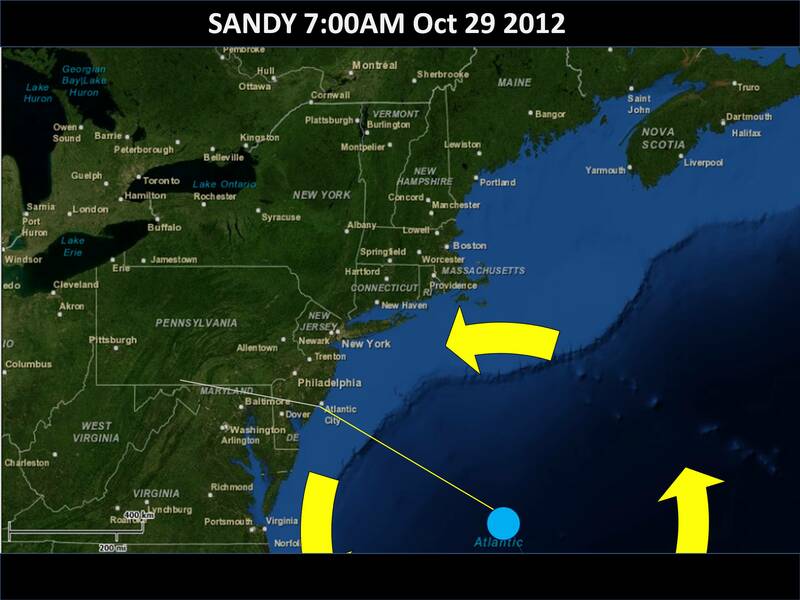 It was nearest to us at approximately the time that it made landfall in NJ (second map above). At this point, our air pressure was at its lowest. (Most of our East-Coast Hurricanes are apparently formed when upward convection off of warm, east-Atlantic seas teams up with thunderheads coming off of Africa. Self-enhancing winds are created as hot air rises and adjacent air rushes in to take its place. That upward current of air causes ground level air pressure to sink and, roughly speaking, the lower the air pressure, the stronger the hurricane tends to be.) Being almost due north of the eye, our winds were from the east. Our winds were highest as the storm passed closest to us. Finally, as the storm headed west, we were northeast of its wind circle and hence received our winds from the southeast. Air pressure rose and winds calmed. The air we were receiving was primarily warm air being dragged north. Notice how air temperature rose as the storm approached. Perhaps this warmth helped the air hold its moisture (colder air can carry less moisture, so marked cooling of moist air can cause rain), and we received little rain. As the storm passed, seasonably cooler air arrived. 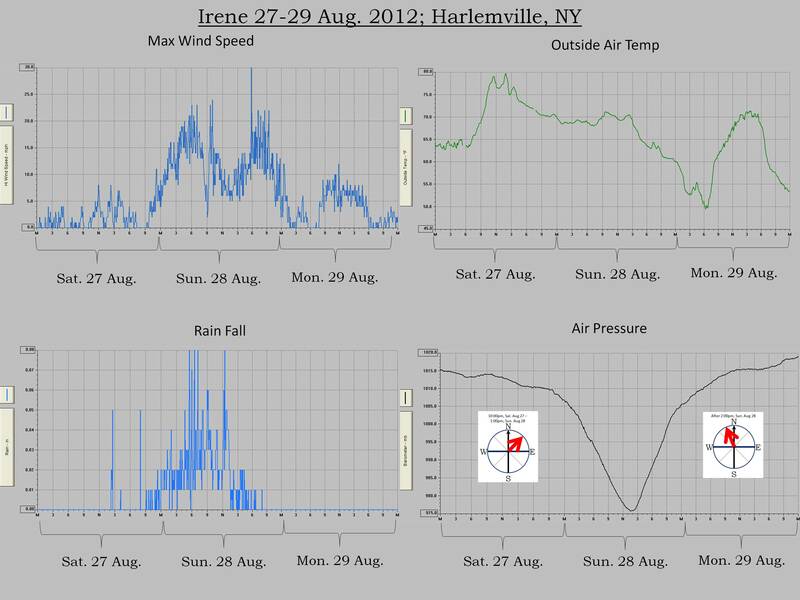 Now let’s contrast that story with Irene’s course and local effects. The above are modified versions of the storm tracks maps available from NOAA’s slick Historical Hurricane Tracks site. 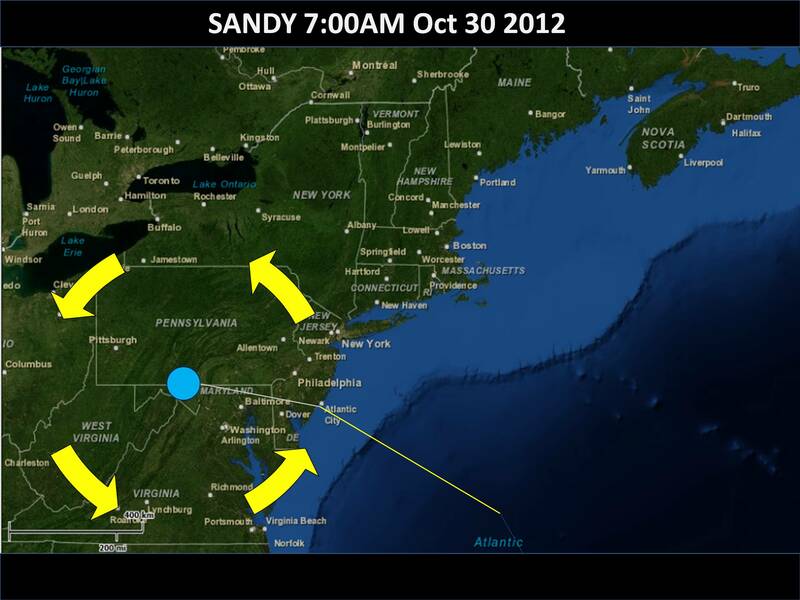 Again, I have superimposed the yellow arrows to help us think about the winds. 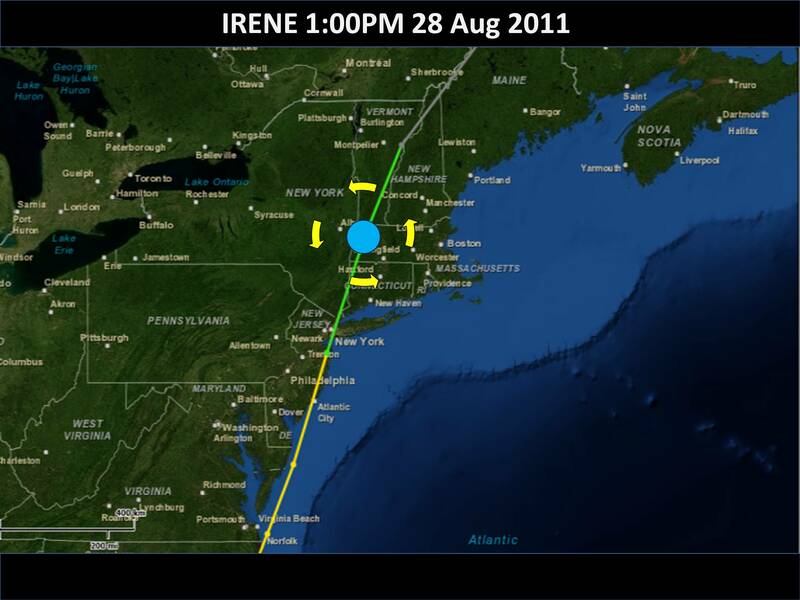 Hurricane Irene followed the coast northward, and then passed slightly east of Columbia County. 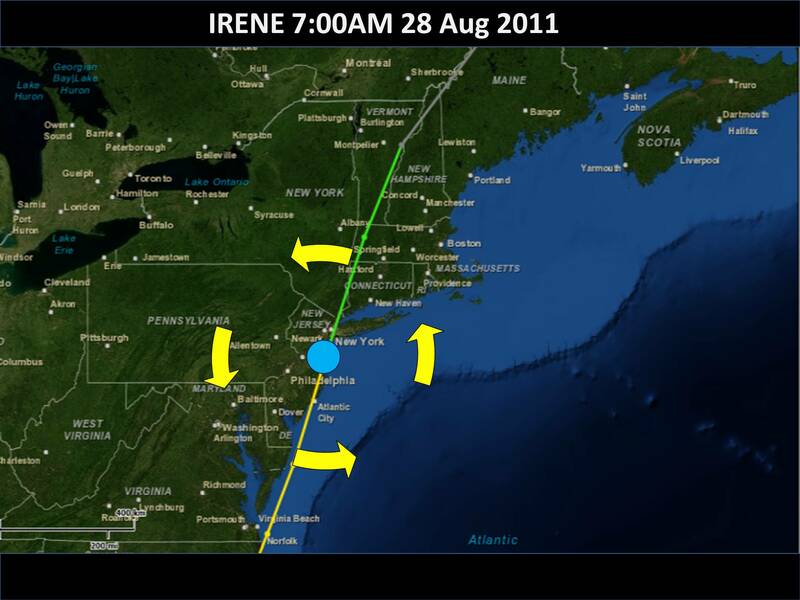 As Irene approached us (top map in above trio), we were slightly to the northwest; this was also the case with Sandy. 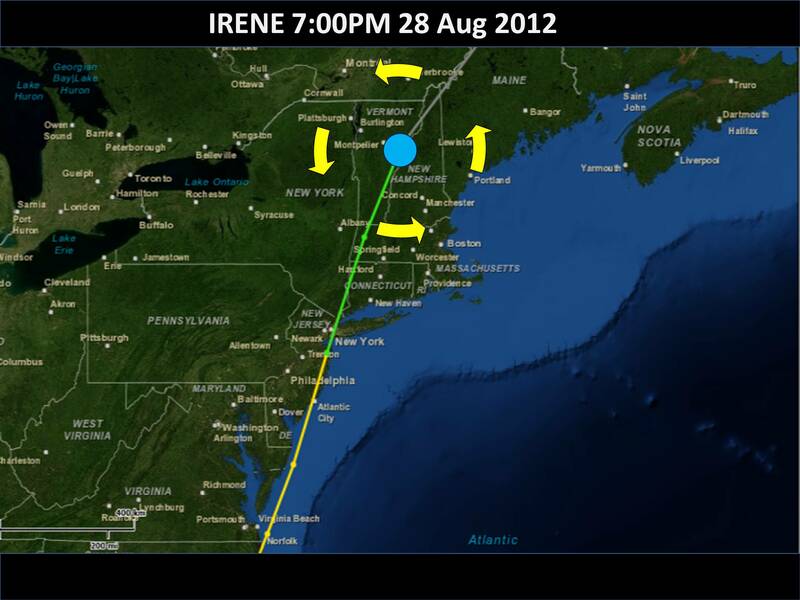 However, unlike Sandy, rather than turning west Irene continued north, passing almost directly overhead. 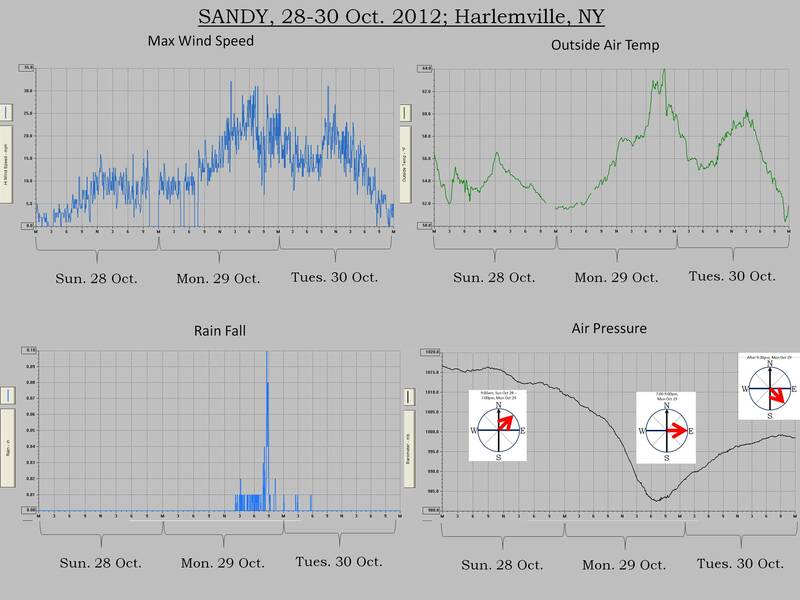 The wind speed diagram suggests we nicked the eye (middle map above), there being a distinct lull in high wind speed coinciding with the lowest air pressure which was substantially below what we measured for Sandy. Our rainfall was primarily associated with the arrival of Irene; rain dropped and cooler air, perhaps pulled in from the north, followed as Irene moved off (bottom map in above trio). Wind bearings were somewhat confused, especially as and after Irene passed, but winds during the second half of the storm tended to be out of the northwest, as would befit us being southwest of the system. 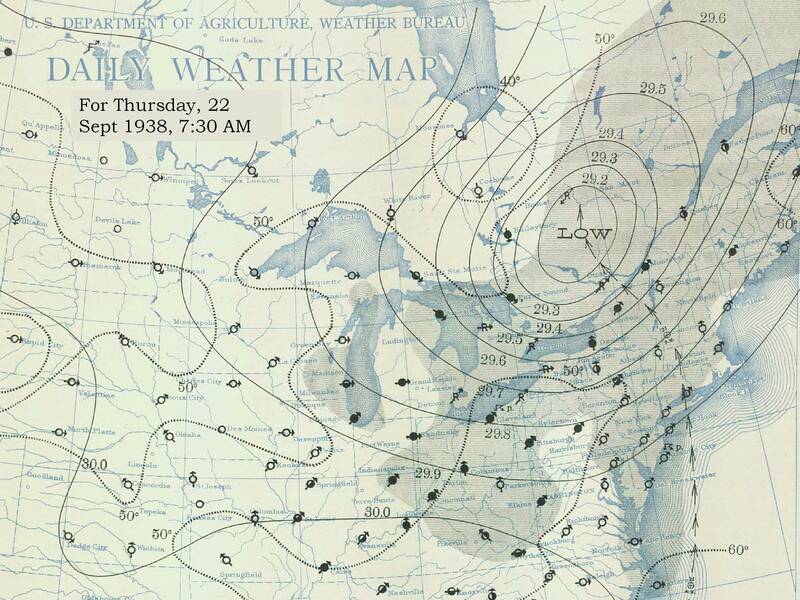 The last storm of our collection is the “Great New England Hurricane” (also called, the “Long Island Express”) of 1938. Much has been written about this storm (see for example, the resources on the Hurricane’s wikipedia page). The maps below, again modified from NOAA’s Historical Hurricane Tracks web page, show its course. 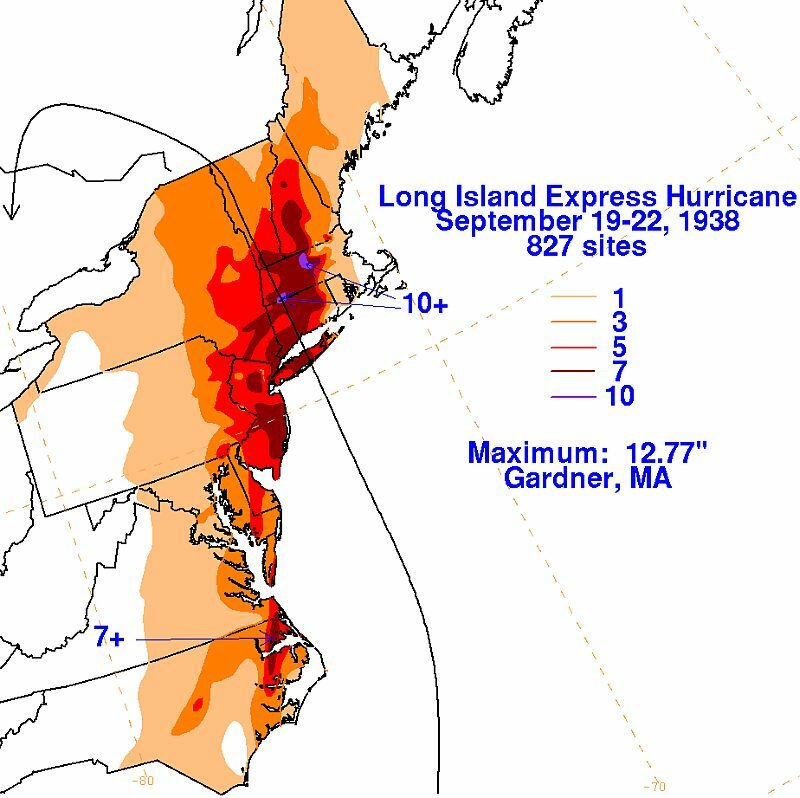 In our area, the 1938 Hurricane followed a path not so different from Irene. Note however that it was probably a category 3 hurricane when it came ashore and the entire system was moving forward at a fast clip (reportedly ca. 45 mph). In any case, here’s a weather map from the day after the ’38 hurricane’s land fall that might give you a bit of a feel for conditions. This map from the day after the 1938 hurricane provides what must have been a surprised first glimpse of the storm’s path and intensity; this image is from NOAA’s historical weather map collection. As subsequent data collection and summary suggested, the storm was more severe than this map might indicate. It is estimated (see next link) that air pressure at land fall was 941 mb or, using the inches of mercury units of this map, 27.1. We haven’t found any precise local meteorological data, other than what we cite in our earlier table. Indeed, relatively few weather stations recorded its passage (for information on the detective work needed to assemble such pre-satelllite hurricane biographies, see this meteorological summary). Some attempts have been made to model the storm’s weather (for example, see this well-illustrated report). The map below shows estimated rainfall. Those data, together with the flooding described in the Courier and elsewhere, suggest that Columbia County probably received more than 5″ of rain in relation to the storm. As reportedly tends to be the case, the west side of such storms gets substantial rainfall. This historical rainfall map was constructed by NOAA, and is available on-line. Wind measurements during the storm were apparently few and far between, but the distribution of wind damage has been used as a substitute. The map below shows the distribution of timber damage. It’s important to realize that the heavy rainfall and sodden soils associated with the storm made up-rooting especially likely. 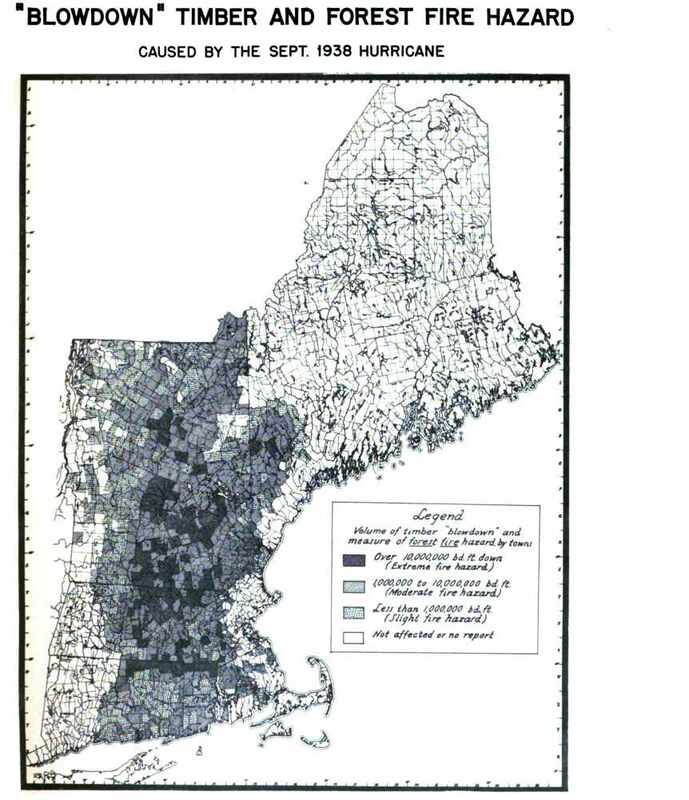 This map, dug up by the authors of the aforementioned modelling document, was assembled in 1943 by the Northeastern TImber Salvage Administration (NETSA) in their report on the consequences of the 1938 hurricane. Comparing this to the earlier maps of storm’s track suggests that winds were highest east of the storm and that, while Columbia County got a good battering, the worst was elsewhere. To close this posting, I’d like to return for a moment to my second initial question. As the above account of the 1938 hurricane hints, weather prediction and monitoring have developed rapidly. 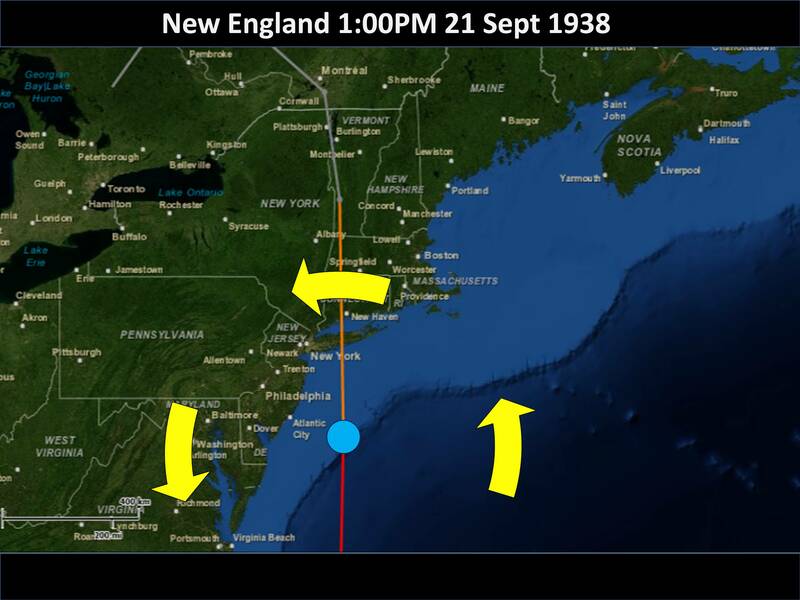 There was little or no forewarning when the 1938 hurricane crashed into Long Island and then Southern New England. There are numerous accounts of the sudden, desperate realization of those in its path that something out-of-the-ordinary was happening. Contrast that with the long build-up and largely accurate predictions that accompanied Sandy. The 1938 hurricane probably happened on the cusp of the technology that would facilitate much improved predictions. The previously mentioned detective meteorology makes ample mention of readings made by hapless ocean vessels that stumbled into the hurricane’s path. Airplanes were just entering into service for such matters. Only two years before the 1938 hurricane, the Government had approved the use of airplanes in storm tracking; they went into regular service in 1944 (see wikipedia article). Radar would come of age in the Second World War, although it would not be applied to weather monitoring until the 1950s. The following are among the most popular prognostics indicative of rainy weather… rheumatic old persons complain of aches, cats wash their faces, dogs grow drowsy, hogs run with straws in their mouths, leeches in jars become uneasy, flies bite and frogs are noisy, spiders foresake their webs, and are seen crawling on walls and fences, cirrous clouds, commonly called mare’s tails, in the sky, insects draw nearer the earth as moisture accumulates in the atmosphere, consequently swallows skim the surface of the earth in order to obtain them. However, not all watched signs were so earthly. Halos and ‘dogs’ around the sun or moon were also considered informative. These arcs and dashes of light do reflect upper air conditions and are reportedly caused as ice in high clouds refracts the light of sun or moon. 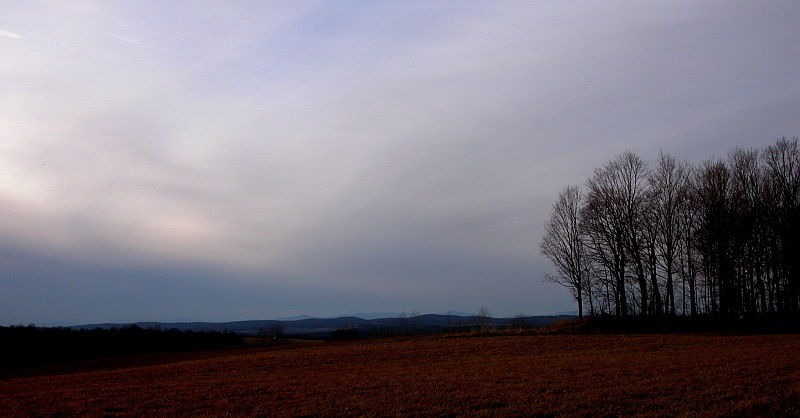 Because such high clouds often precede a warm front or similar system, they can actually forecast coming weather. The below mosaic of images was taken two nights before Sandy’s arrival. 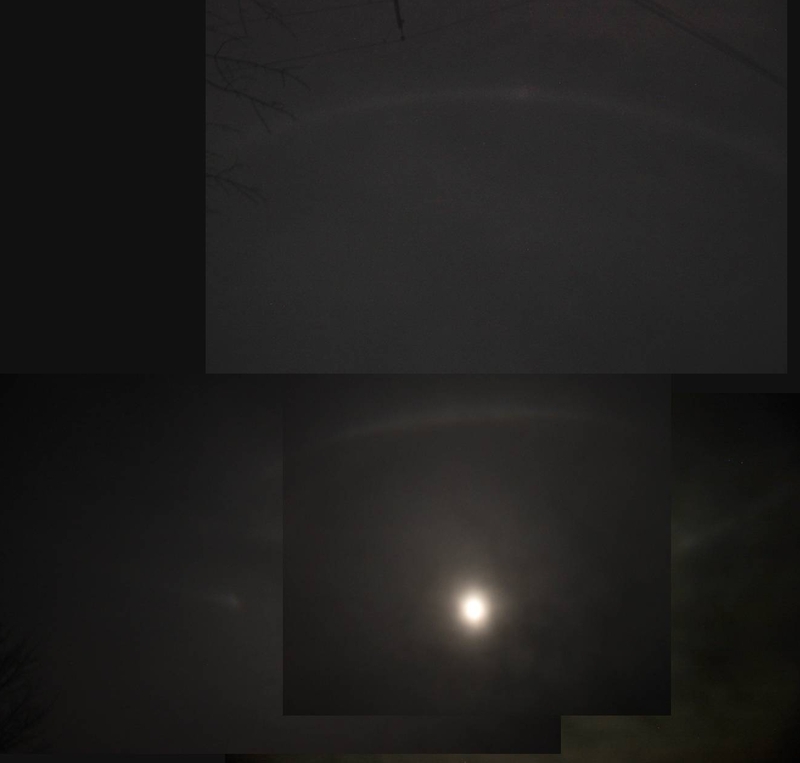 This mosaic shows moon dogs, a shallow arc close to the moon and then a more distant, halo-like segment (the upper halo was photographed at the same time as the rest of the images but may not be positioned quite at the right distance from the moon). We were not the only ones to notice Sandy’s celestial display. Corrections, re-interpretations, additions, complications etc. for this blog are all welcome.